We need to create raita as side dish for Biriyani and other rice based recipes. 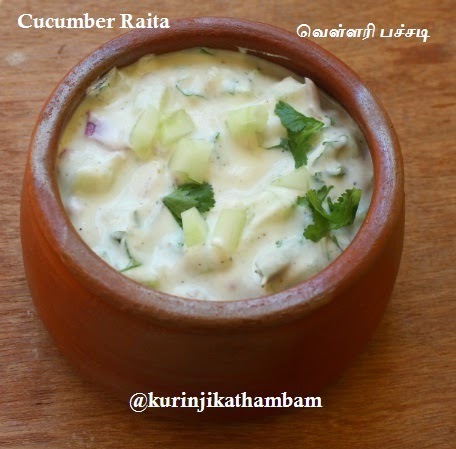 Cucumber raita is a healthy variant. You can also have it as a stand alone cool dish during summer. 1. Wash and peel the skin of the cucumber. Then cut it into small pieces. 2. Peel and chop the onion into fine pieces. 3. 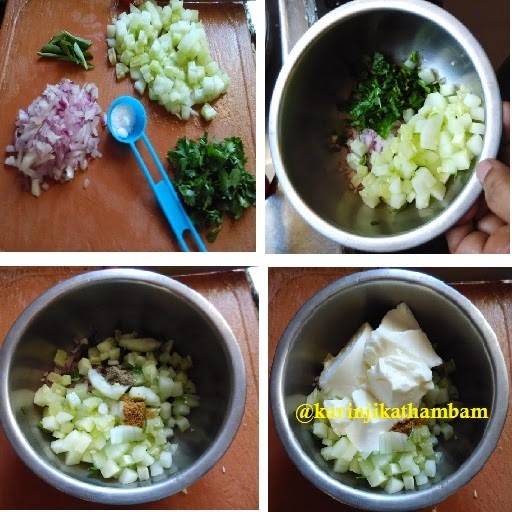 In a bowl, add chopped cucumber pieces, chopped onion pieces, curry leaves, coriander leaves, salt, pepper powder and cumin powder. Mix them well. 4. Now add the curd and mix them gently. Cucumber raita is ready to serve. This goes well with roti, pulao and biriyani.